Image credits: “Agriculture andrRural economy – Charcoal → .” The Encyclopedia of Diderot & d’Alembert Collaborative Translation Project. Ann Arbor: Michigan Publishing, University of Michigan Library, 2010<http://hdl.handle.net/2027/spo.did2222.0001.346>. Trans. of “Agriculture et économie rustique – Charbon de bois,” Encyclopédie ou Dictionnaire raisonné des sciences, des arts et des métiers, vol. 1 (plates). Paris, 1762. Historical ecology is the study of long term interactions between people, their institutions, and their environments. We will critically evaluate arguments about the current relationship between people and the environment in popular texts using archaeological, historical, and ethnographic evidence. Many current pressing issues can be assessed more appropriately when viewed from a long-term perspective gained from an historical or archaeological approach. We will focus on some of these issues. Some questions that will be addressed include: Where do people encourage the spread of forests into the greatest desert in the world? Where does an increase in population result in less environmental impact? Can the poor soil of the rainforest support ~civilization~? We will also examine the local environment over the past 100 years. Meets general academic requirement DE. Statement on Openness: In this course, we will try to abide by an ethic of openness. That is, we will attempt to use tools that are open, data that is open and contribute to the knowledge and data available to the public. – Identify four distinct, yet overlapping modes of subsistence: including hunting and gathering, extensive agriculture, intensive agriculture and industrial agriculture. – Describe how different modes of subsistence utilize and affect people and the environment differently. – Perform historical research to better understand land-use patterns and how they affected the ecology and landscape. – Synthesize historical research with the mapped landscape. All assignments are to be turned in via Canvas. They are due one hour before the class for which they are due. Please bring a copy to class because assignments the basis for discussion. lastnamefirstinitial course number description (for example, if I was turning in my final paper, I would name the file carterb ATH262 charcoal paper final.doc). All documents should be submitted as Google document (I may request MS Word (.doc or .docx) or LibreOffice (.odt) files for some assignments- check the assignment description). Formats for turning in maps, etc. will be discussed later. All assignments should be written in Times New Roman, 12-point font, be double-spaced and have 1-inch margins. Writing Journal– For each class day, you must write an entry in your journal. What are the lessons of Historical Ecology? How do scholars “do” historical ecology? What are the methods? What would you like to know more about? What is unclear or incomplete to you in the reading(s)? For each class day, you should address each of these questions with approximately 150 words. Your full entry should be around 400 words or more (c. 2 pages). Please provide evidence, such as citations or quotes from the text. You should be referring back to previous work as well. For example, you could write something like “According to Cronon (1983, 25), Historical ecology is “…”. However, this seems to contradict what Crumley (1994, 56) states, “…”. Bring your readings into conversation with each other. What questions is the discipline trying to address? What time span is it generally concerned with? Please do not copy or replicate a definition from your readings. Use the scholarly definitions as a starting place and work from there. Provide evidence for your discussion from your readings. Be sure that all evidence is cited (see citation details above). Compare and contrast the four major subsistence strategies; hunting and gathering, extensive agriculture, intensive agriculture and industrial agriculture. How are they different (consider time expended, amount of land required, energy expended, “efficiency,” environmental impact, population supported, etc.)? Under which conditions do different strategies “fit” better? Map– Mapping is one of the best ways to both analyze and visualize the historical landscape and how it was used (or not). You will develop a printable map that demonstrate at least two different aspects (e.g., charcoal roads and charcoal hearths) of interpretations that you have reached about the charcoal/ iron landscape of the Blue Mountain. You will utilize QGIS, a free and open source software (FOSS) package to integrate distinct types of geospatial data (vector or raster; point, line or polygon) to represent your interpretations. You will produce a map in pdf format. Map must include a compass rose, legend (identifies symbology, author and a brief title), scale, grid (hashmarks down the side), and caption. The map must utilize at least three layers (potentially more). Bonus points if you create your own layer! The map must visualize at least one relationship between components of the charcoal/ iron industry of Lehigh and Carbon Counties. You must indicate this in the caption. 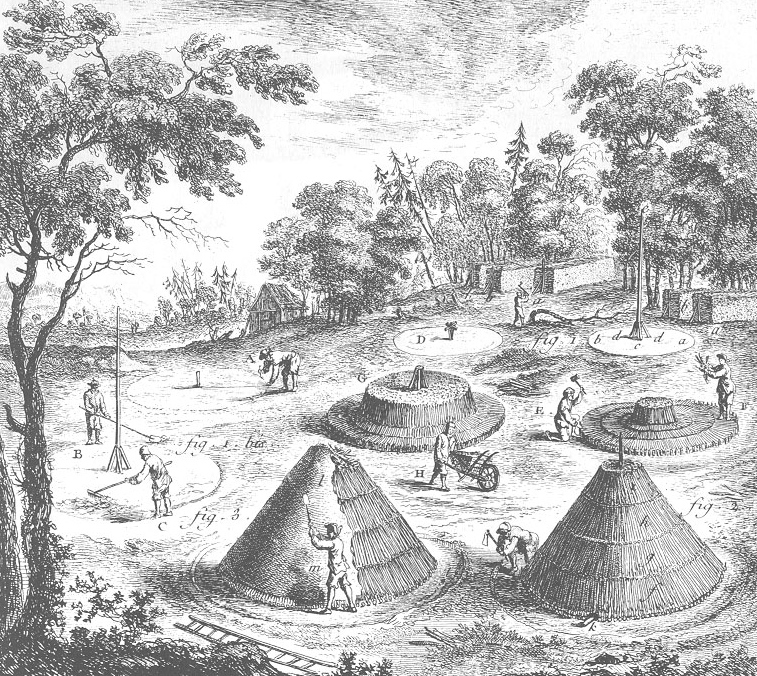 This aspect should demonstrate how the landscape was employed by one or more of these industries (charcoal, iron or both). This can primarily be environmental, human or a mixture. Lehigh Valley Paper– One of the components of this class will be investigating the historical ecology of the Lehigh Valley. We will focus upon the charcoal and iron industry of the 19th You will complete a research paper that considers some aspect of this industry. You will be provided with many more details regarding this project in the future. How has this class changed your understanding of the environment and the landscape around you? How has this class changed the way you see landscapes and subsistence strategies that are unfamiliar to you? How has the concept of “Historical Ecology” changed the way you see research (look back to those original papers from the beginning of class)? What do you think you will- or may- change about your behavior because of the lessons learned in this class? This can be both about local landscape, but can also be about how “we,” as the United States, engage with the world. What questions remain before you can commit to a change in behavior? What questions has this course raised that remain unanswered, but that you would like to know more about? If you had the time, how would you go about researching these questions? In the process of writing this paper, please be sure to CITE (in Chicago style, see above for links). Remember that you can be general- for example, when discussing the importance of fire, you can cite Pyne, even if you don’t have a specific piece of data or a quote. This simply declares that you learned about this from Pyne. If you discuss the role of fire in swidden agriculture, cite Conklin, etc. Participation– Your participation grade is for your participation in class and during field trips. Please note that, many of your assignments are based upon your participation. Therefore, overall, participation is a substantial portion of your grade. ****IMPORTANT***** Although you recieved a printed version of the below in class, your real and up-to-date schedule is on Canvas (which cannot be posted here 🙁 ). Note: You must read the readings for the class that takes place on the day for which it is listed. A Topics are well understood and deeply considered. Very few ‘simple’ mistakes. Perfect to near perfect.